So we've been here in Vauréal for over a week now, perched 40 minutes away from the most famous city in the world and we still haven't left the apartment to go visit it. 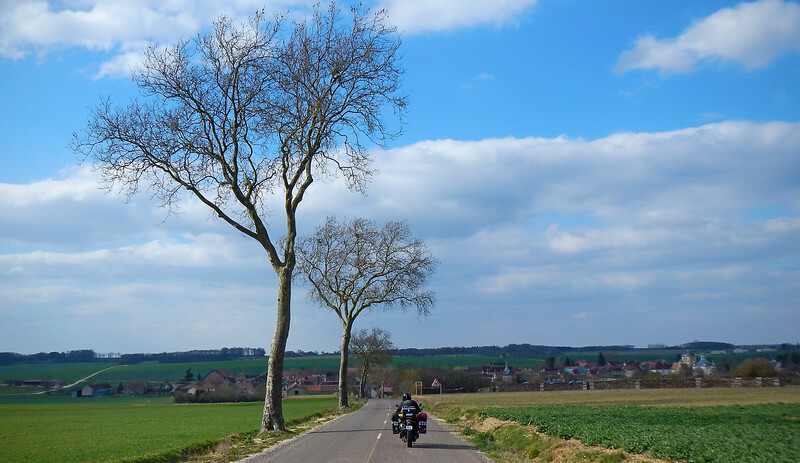 Everyday we find some excuse not to ride in to see Paris: "Looks like it's going to rain today", "We woke up too late", "Gotta go to the grocery store to buy more terrine..."
The landscape here is fairly flat, the smell of fresh manure wafting up through our helmets as we ride by the green fields that lie between all the quaint towns between Vauréal and Paris. We picked a weekday to go, staying off the highway, and we're rewarded by having the roads all to ourselves. Traffic is not so bad in the big city! 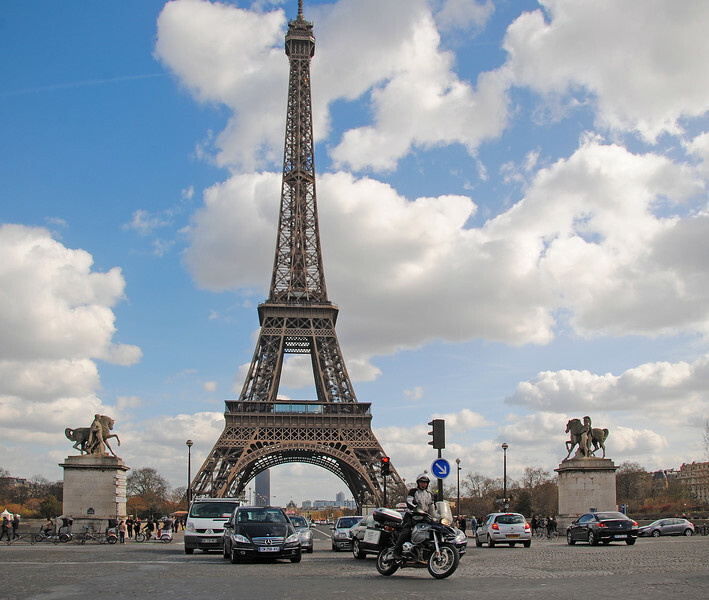 Marielle had advised us beforehand not to ride in Paris because of the congestion and the crazy drivers. We've heard this warning before in every major city we've been to and no offense intended to those giving us this advice, but they're probably not aware of all the places that we've ridden in and that our definition of "bad traffic and crazy drivers" is very different than theirs. 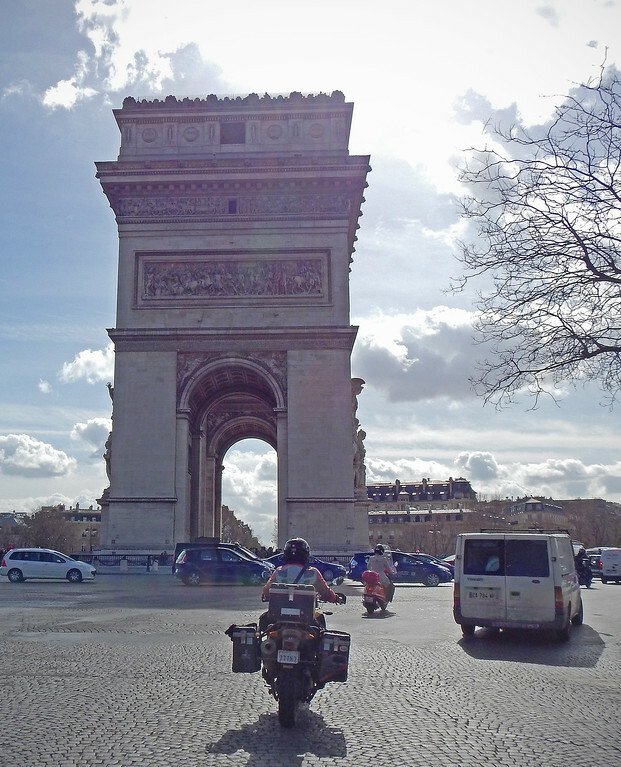 After riding through the pure pandemonium they call traffic in Delhi, Bogotá and Mexico City, motorcycling through Paris and Rome is like strolling carefree through an open field. 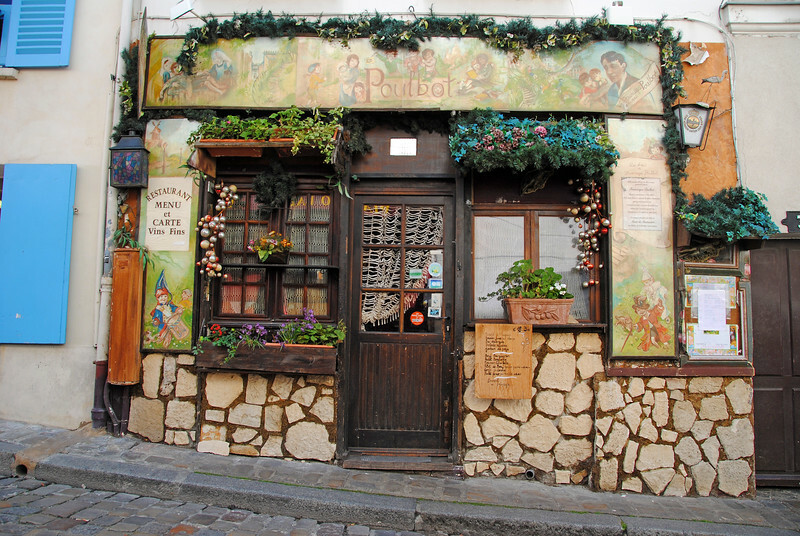 One of the places Marielle recommended for us to see was Montmartre. 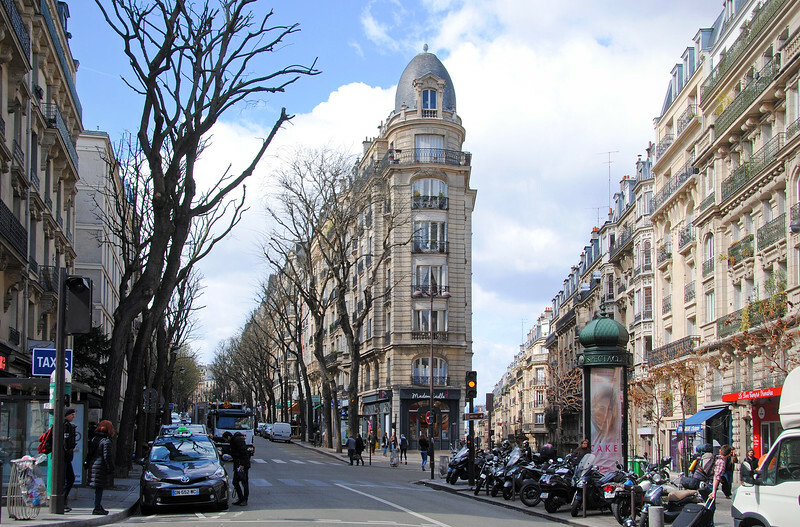 Situated on top of a hill overlooking the rest of Paris, it used to be an area of the city that was filled with bohemians and artists at the turn of the last century. 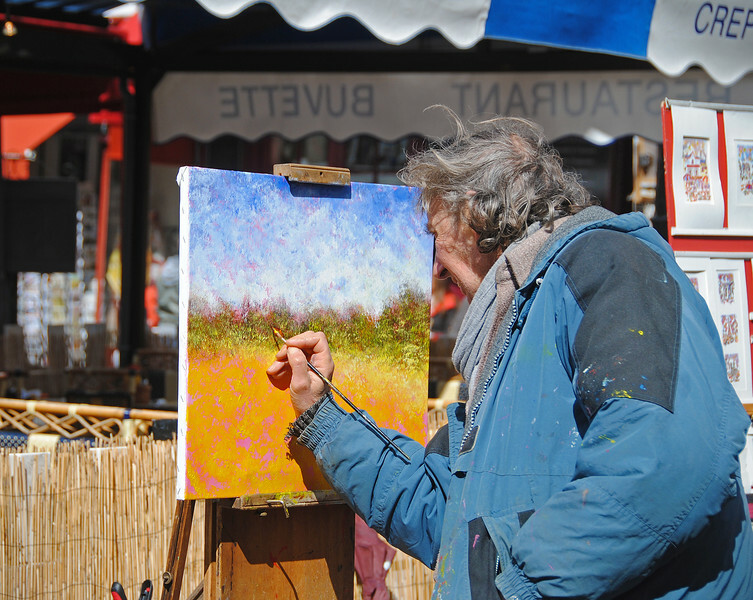 In fact, Montmartre is right next to the Moulin Rouge. 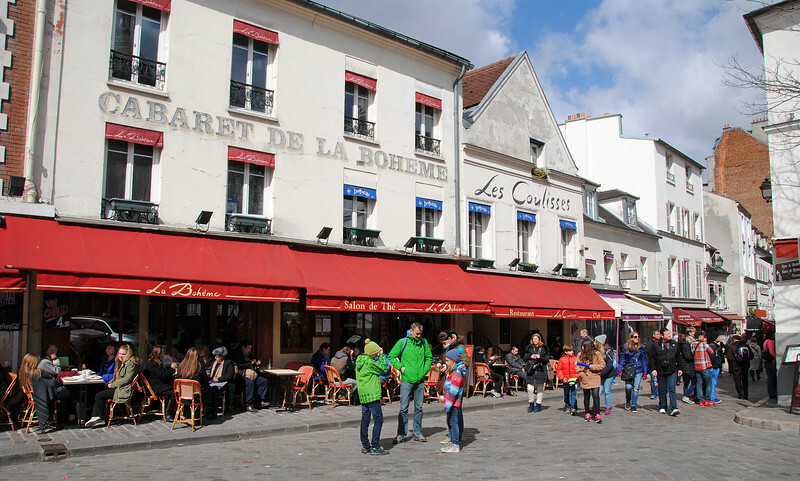 But any of the low-rent, ramshackle buildings occupied by writers and painters who voluntarily gave up their aristocracy to pursue "la vie boheme" have now been replaced by restaurants and souvenir shops catering to the hordes of tourists who visit every day. 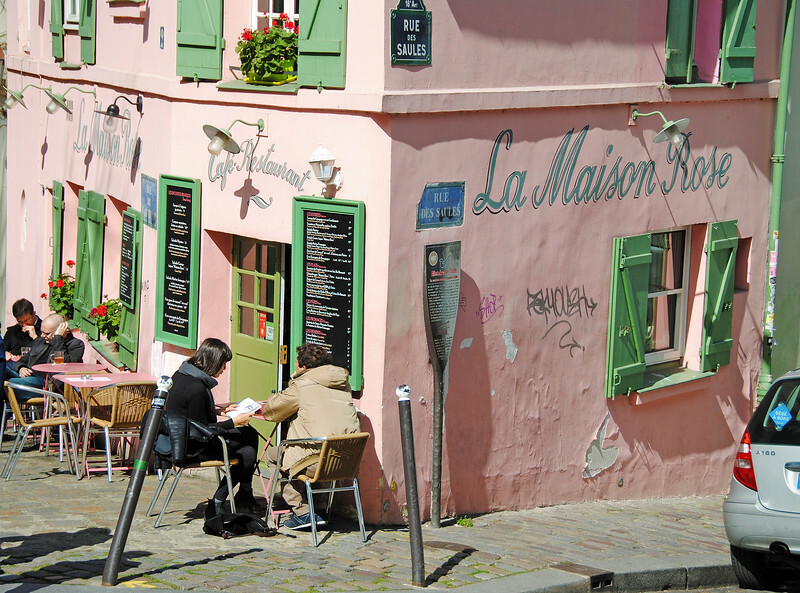 What is more stereotypical than street-side bistros in Paris? 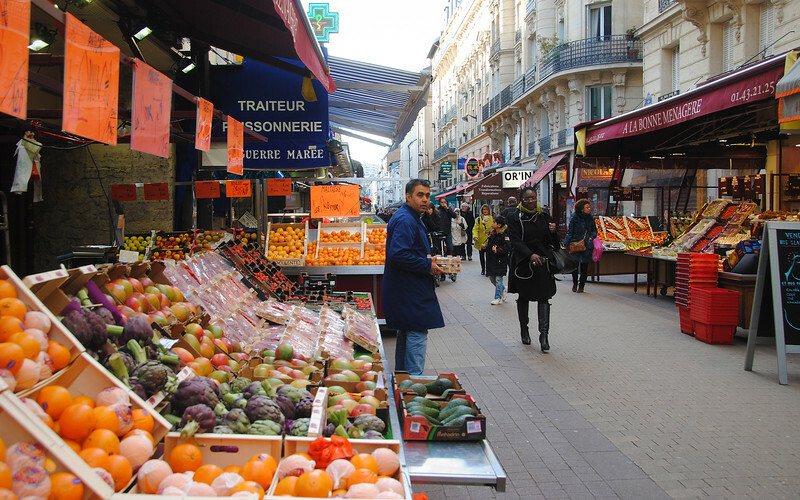 While walking around, we stumbled upon the market on Rue Daguerre, a pedestrian-only street with fruit and vegetable stands enticing passersby. 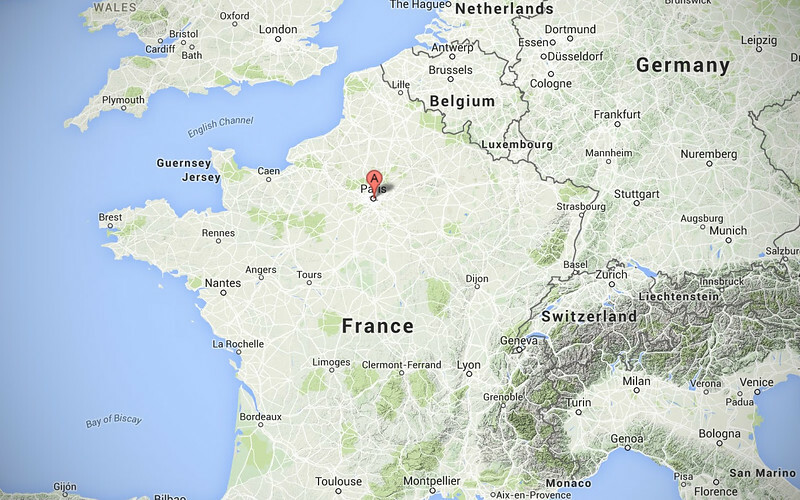 You can duck in and out of all the fromageries lining the avenue. There are tons of these market streets all over the city and they felt a bit more authentic and local-oriented than the tourist traps that we came from. Obviously you can't see all of Paris in a day, which is exactly the time we've given ourselves to do. So we each picked a couple of places of interest and we rode around the city, crossing them off one by one. And once again, we parked pretty much anywhere we wanted without paying any fees! 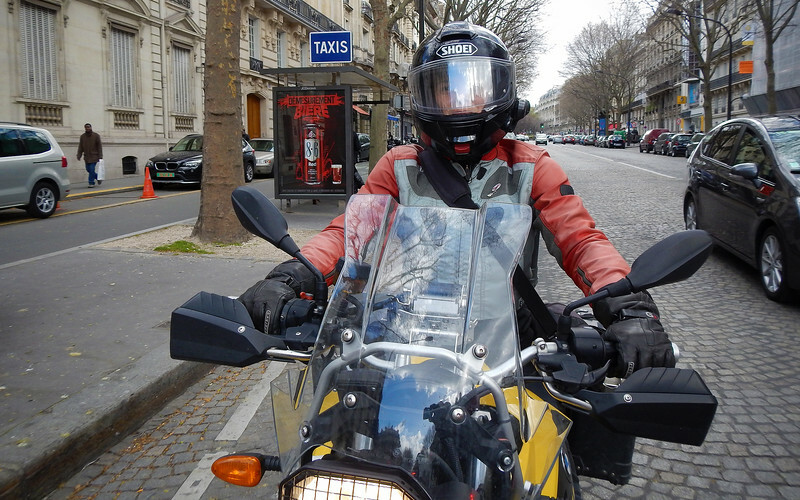 I love motorcycling in Europe! Two-wheelers crammed on every square inch of sidewalk. For free!!! 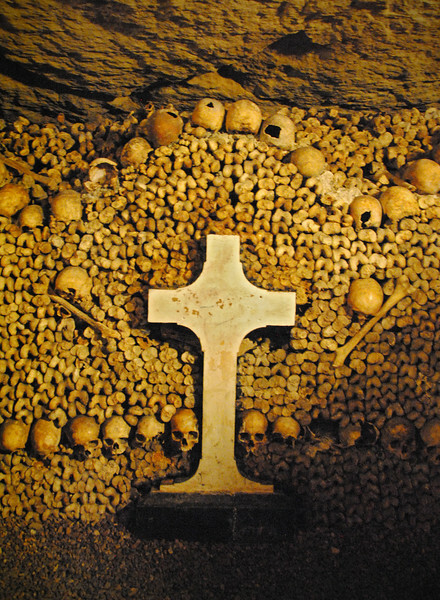 One of the places on my list were the catacombs underneath the city, the main reason being that I read about it in "The Da Vinci Code". 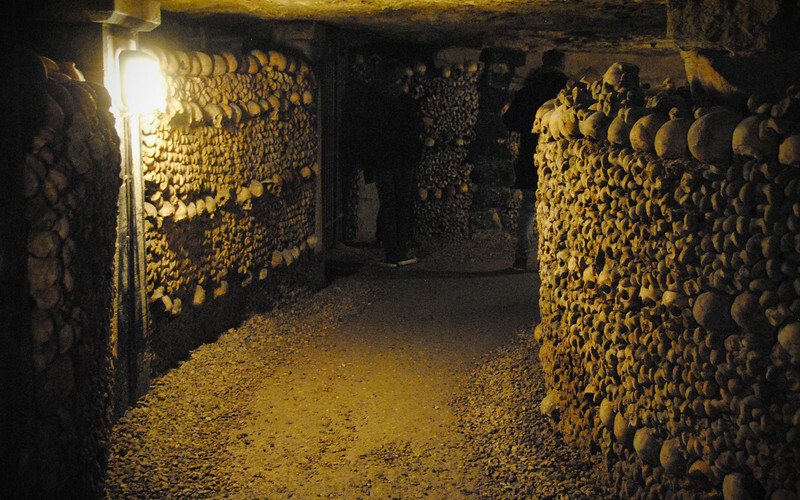 There are many tours in the city based on the book, but they're all too expensive, so no Louvre for us, just the creepy catacombs, please. Our tour underneath the city yielded some very interesting facts. 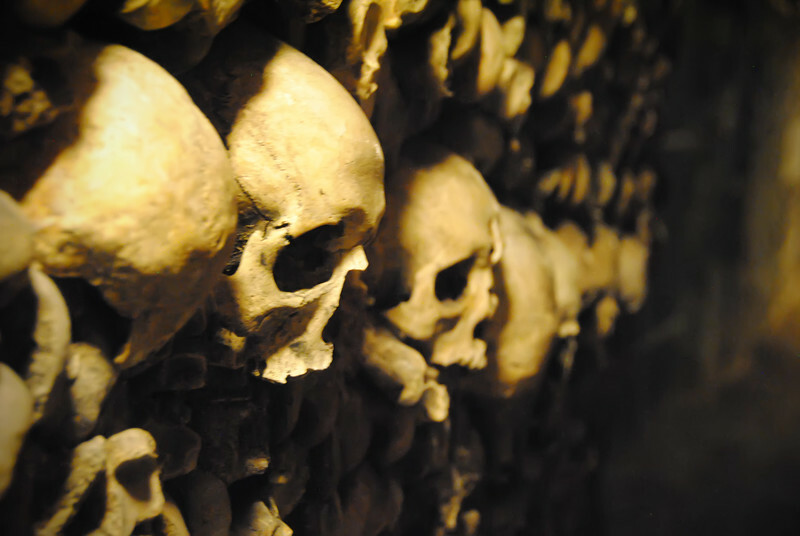 The catacombs serve as a mass storage site for the remains of 6 million people who lived in the Paris area over the last 300 years. 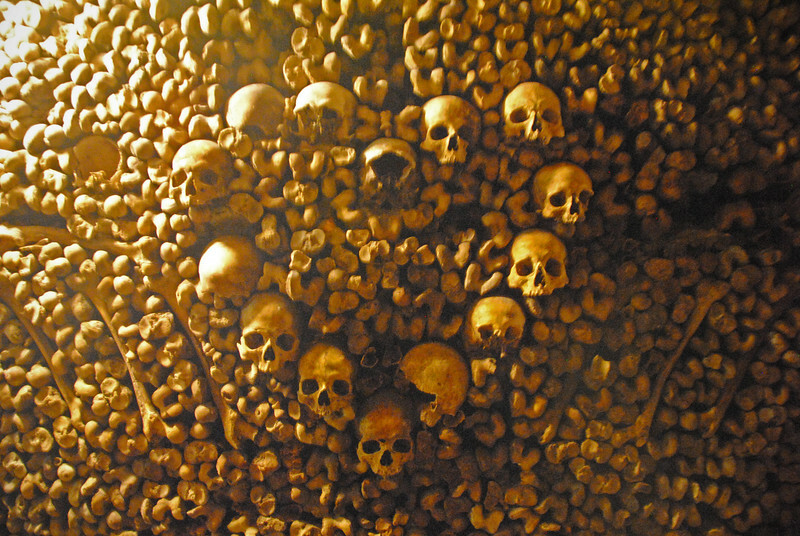 They were originally moved from cemetaries because of overcrowding of the bodies, leading to improper burial, bad smell and the spread of disease. At many points, there are small signs pointing out the date of the bones. It was interesting seeing how the older ones from the 1700s were much more yellow and worn-looking. It was slightly creepy being around all these dead bodies, but yet strangely fascinating at the same time! 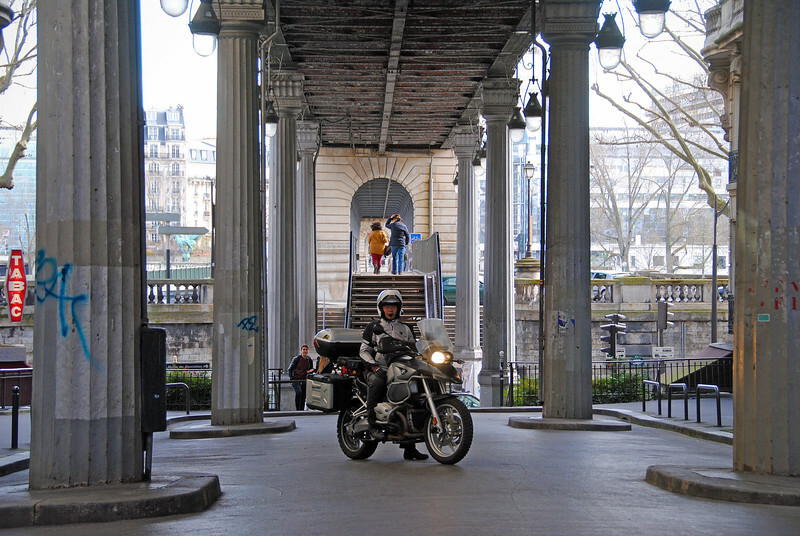 We emerged above ground far from where we entered and had to consult a map to get back to our motorcycles. 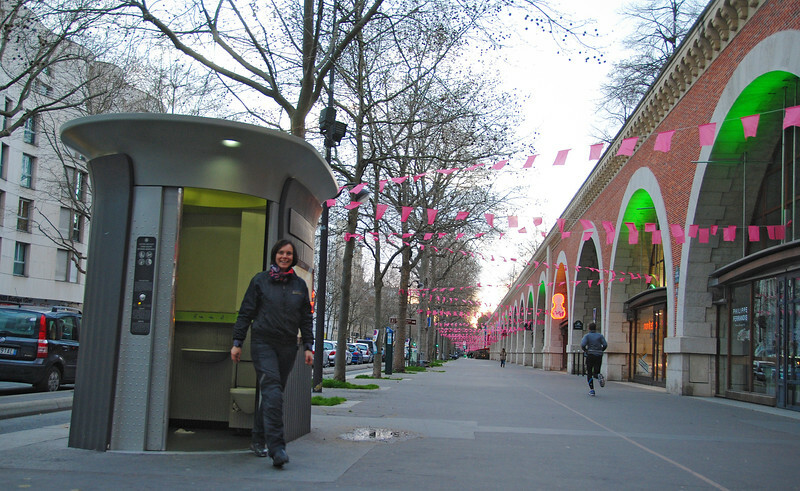 It was Neda's turn to pick an interesting Parisian spot to explore. This washroom was self-cleaning. And free! Very cool. Neda has very different tastes than most people. In restaurants, she's always ordering the more unusual items, and it's the same when it comes to sightseeing. 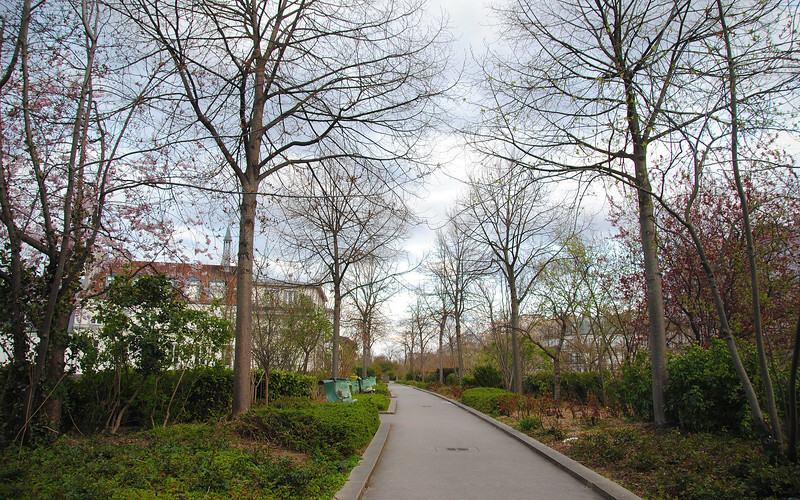 What caught her interest was a park called the Promenade Plantee. You can actually see it in the picture above, the park is elevated above the city streets to give it a bit of isolation away from the traffic of the city. 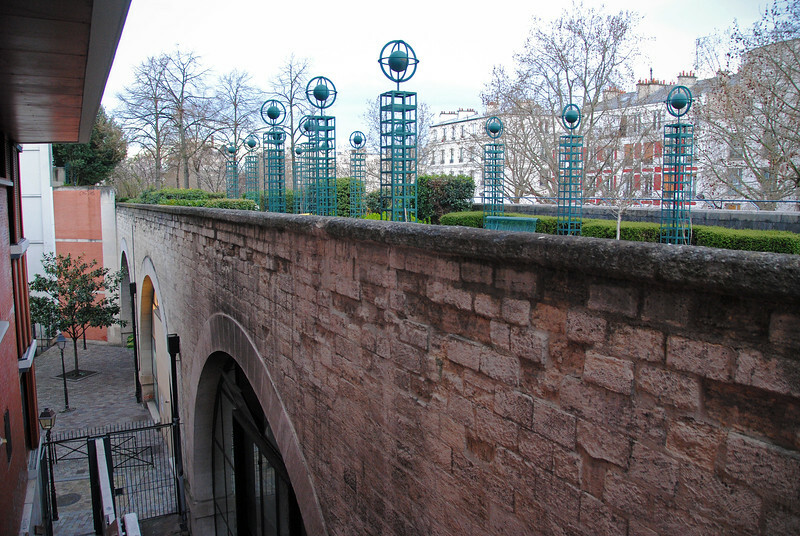 The Promenade Plantee used to be an old elevated railroad which was torn out and replaced with a narrow garden that stretches through Paris. Stairs to get to the park are situated every few hundred meters and once you are strolling above, the big city seems to disappear. Feels just like walking in the countryside! 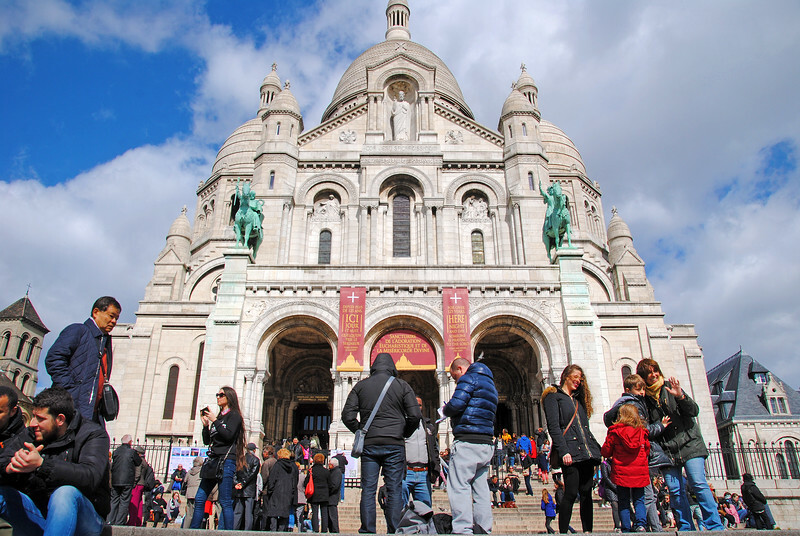 Paris was nice, but we weren't in the right mood to truly soak up the City of Love. At least by foot. So we hopped on our bikes and just rode around town. At one point, we passed by this structure. I radioed Neda, "Hey, is that the...? naaaah, couldn't be...."
This was also an item on my list. Again, we approached the spot where my GPS said it would be and I looked over at the structure peaking above the trees. I radioed Neda, "I think that's the Eiffel Tower, but it looks kinda short. Maybe it's a miniature? And the real one is somewhere closeby?" 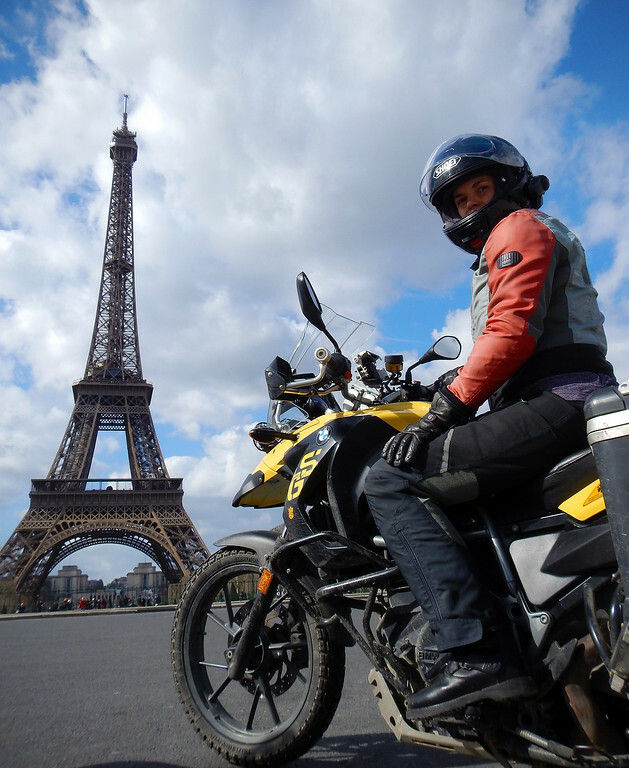 Sightseeing is soooo much better on two-wheels!